its going to be 2020 the days of everyone having to fix all the broken missions themselves seems outdated and the idea a person has to ask permission to fix a mission that was either always broken or broke due to newdark/patches from original creator is not right in my view,its not like you want to change mission ,just fix the issue to make it completed. We're halfway there, sort of. fortuni's Mission Description thread notes whether missions need a fix or not and contains links to said fixes. I agree with downwinder. It would be nice to have fixed missions rather than having to apply fixes. I also have trouble sometimes doing the dmls. I know its a lot of work and would be greatly appreciated. But at the same time I understand if you can't. I know voodoo is working on scp5 and other projects we are all waiting on. Yes for those that may not know voodoo does a lot of work for the system shock community as well. I know unna does a lot too. First thing is that all the hard work has been done by me. 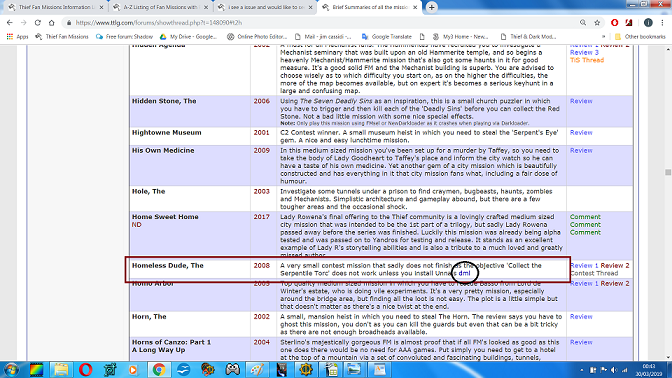 I've gone through every T1/TG mission and every T2 mission up to 2004, and I'm now halfway through 2005 missions and so far have been responsible for fixing about 130 missions. I play the mission, report all the bugs I discover to Unna, including obj no's, questvar no's etc and suggest thoughts on what has gone wrong and potential solutions. Unna then makes a dml if possible and I test it, which sometimes means playing the mission again all the way to the finish. Sometimes the dml does not work and Unna tweaks the dml and I have to retest it, sometimes the dml will go back and forth 6/7 times before we get it right. I may spend 2 days on a mission finding the bugs and testing the dml's, Unna may spend only 5 minutes on a dml sometimes a whole day. I've worked closely with Unna for the last couple of years because she understands how objectives work, which Voodoo couldn't always do, and because she's likes a challenge, if I come across a complex issue she'll spend hours, if not days trying to figure out a solution. Secondly we can not fix missions directly. Most authors state clearly in their readme files that no-one can alter or modify their missions. But what we can do is make dml's which is a set of instructions that are given to Newdark, correcting or slightly tweaking what Newdark reads when it scans the authors DromEd instructions, ie it's a bit of a cheat but gets around the sacrosanct rule of not modifying the authors work. I then post the link to the dml in the Brief Summaries and make a note of them in the upgraded T2 lootlists which are being compiled for this reason, to give players professional looking lootlists that reports all loot found via Newdark with dml's installed. Easy to understand instructions as to how to install dml's are found in the OP of the Brief Summaries thread. Read them carefully, take your time, go step by step and they do work. Last edited by fortuni; 29th Mar 2019 at 22:28. Here are some pictorial instructions as to how to install dml's. Please bookmark this thread so you can refer to it in future. 4. 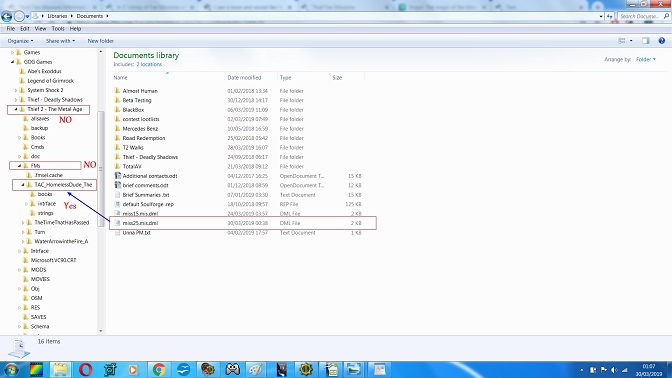 Windows will then save this file in usually your docs folder, but check it may be saved in another folder. Now just move the saved dml to your FMsel mission folder. Do not place it in your main Thief folder, but only in your FMsel folder. You can not use dml's if you use Darkloader, you must only use them with FMsel. And no do not place them in your FM's folder or load them into darkloader, these are mini instructions to be added to the FMsel mission folder to give Newdark extra instructions, they do not work as stand alone files. Last edited by fortuni; 7th Apr 2019 at 09:06.
in before zylon say why don't you do it,and my response would be "as part of the order of the healing fruit i am not high enough rank to have such task's layed upon me"
dewdrop has joined "the order of the healing fruit also"
If I was to publish a book and plagiarised someone else's work I would be taken to court and sued for $1000's, people who copy other people art work go to prison for forgery. We all understand your frustration and desire to make things simple, but in RL you have to follow the rules, and that includes fixing other people fan missions, it's known as intellectual property rights and it can't be done. I'm guessing what downwinder is trying to say is that having the user search, create and load dmls manually is not too great. and I actually agree with that, regular users should not be forced to dig around files. a much better solution would be to include the entire FM fixup dml database inside NewDarkloader (less than 200 files at this moment if I read right, should be just a couple of megabytes if not less), and have it apply the correct fix when the FM is launched (I understand some work has already been done in this area? the readme says "NewDarkLoader can extract the contents of a 'fix' file each time the FM is installed"). ideally, the loader should check an online repo each time it's started, and grab all updated/new files if available. I've done some research on this, and the first part is completely doable - NewDark can autoload a folder with all the dml fixes inside regardless of their filenames, and only apply those with matching fingerprints. I had a prototype of this working (that's why my dmls have fingerprints), but left it alone in the end, as the demand for T1/TG fm fixes didn't seem that big (are the exact numbers of how many TG/T1 and T2 dml fixes exist available somewhere?). one way or another, I think what I'm trying to say here is "lets figure out what the right thing to do here is, and once that is done, do it right from that point onward". Last edited by voodoo47; 30th Mar 2019 at 13:28. That would be so cool if we could get this idea up and running. For T1/TG there are 22 dml's available (but more if you count the individual missions from the Shadow of Doubt campaign that has 5 dml's and 5 .gams), there are 3 or 4 missions that need the old convict.osm installed, 1 mission that needs a missflag file added. I'll be going through the T2 missions (upto 2004) tomorrow and will post the numbers then, but it's approx 65 so far. Last edited by fortuni; 30th Mar 2019 at 13:30.
that seems very manageable. those old convict missions are going to be a problem though - do you happen to have an example of such a mission including a description of what doesn't work (with the new convict) at hand? Garrett's Revenge only an issue if you play one of the zips that do not contain the word 'gold' in it (IIRC there are 5 different zips out there), if so the objective Find information on who, grassed, set up, framed, Cutty' does not work and thus 2 other objectives later in the mission will not trigger either. Information Picking up a scroll in the temple does not complete the objective Find Brother Roban and so the new objective Roban has gone to Lord Durban's town mansion. Follow him also fails to trigger, this prevents you finishing the mission. The Trickster's Return The mission does not finish when playing on expert unless you install the old convict.osm, but does finish on other difficulties. I was pretty sure there was a 4th mission that needed the old convict.osm but can't find which one, it may well be AMIDA which a long time ago you confirmed was a T1 mission not TG as it is usually listed as, and IIRC I replaced the convict.osm and everything worked ok, but this mission has it's own dml so not no problem. 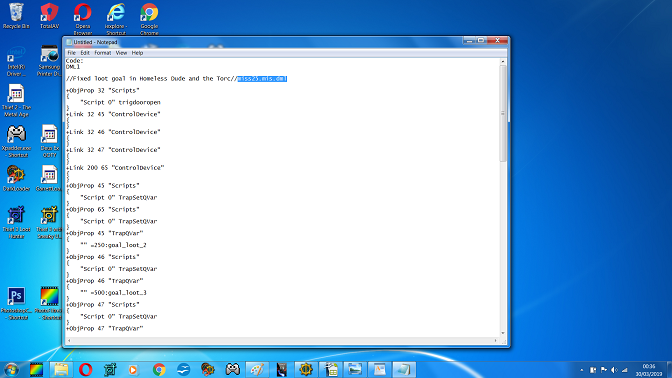 Here's the list of T1/TG dml's, tomorrow will do the same for T2 mission up to 2004. Last edited by fortuni; 30th Mar 2019 at 13:53.
that looks like an adequate amount to try to create a proof-of-concept package. I'll look into it today or tomorrow. There are a couple of oddities, Working the Mines is not a dml but need specific old scripts, Saint's and Thieves need certain scripts deleted once you have installed the dml and The Library - The Town is just bizarre, the dml worked fine with ND1.23 or 1.25 but doesn't with 1.26, even worse the mission now seems to have a problem with bad saves, so your idea to automatically load dml's will not be suitable for all missions. To give you an idea I've gone through approx 325 T2 missions so far, from 2000 onwards, so there must be 600+ more missions to check, of which I'm guessing about 400 +/- were made using olddark. So maybe we'll end up with somewhere in the region of 200-250 T2 dml's. Last edited by fortuni; 30th Mar 2019 at 16:58. I'm very sure not all FMs will be fixable this way, but any system that works 80% or more is a good system. the T1/TG test package - extract to a TFixed TG install, and add "FMdml" folder to the cam_mod.ini modpath, and launch a mission from the previously posted pdf list. - the first goal target qvar with a non-zero value is used for fingerprinting, looks like this is working well so far. - the mission dml format is first three letters of the fm name underscore mission filename. - I may have fixed the issue with old convict, whoever can speedrun any of the affected missions is welcome to check (Information, Garrett's Revenge, The Trickster's Return). - I have more fixes in the repo than mentioned in the pdf list. uhh, any idea what they are, anyone? - no idea what the fix for The Gem is supposed to be, looks like a fam texture. - Mine Shock and Hellerhouse probably not fixable in this way. - Trial by Night looks like just me playing with candles, no real fixes there. - resource loading is very limited, but custom obj fixes seem to work (check the improvised lockpick in the second SOD mission, should be a nail now). as long as the fixed resource is using custom filename (not using a vanilla resource name), it should be safe to have it in the package. that basically means missions like Mine Shock are out, as we can't pop a full mission file there. test to DEATH and report. Last edited by voodoo47; 31st Mar 2019 at 16:26. 1. I assume all I need to do is check that the dml is loaded into the FMsel folder and that I do not have to play each mission all the way through to the end? FMselBak.zips from my FM folder would that guarantee that I won't be loading the previously used dml which would then give me a false positive when testing your package? Circle of Strain + Calendra's Cistern can now both be removed from your repository as there is no need for them since Anti_Matter has produced Newdark versions of those 2 missions that fixes all the bugs. The Gem is the 4th T1 mission that is fixed by installing the oldconvict.osm. Without it the objective to 'Find the Worthington Manor' does not check off. Trial by Night had a problem when you climbed into the attic when playing via Newdark 1.21a, I don't know why but your little fix with the lights solved this issue. Last time I played via 1.25 the problem did not occur. I have more fixes in the repo than mentioned in the pdf list. uhh, any idea what they are, anyone? Which Fixes are you thinking of? Last edited by fortuni; 31st Mar 2019 at 05:17. After testing Information rather extensively, I can conclude this method to be working well; oldconvict.osm is loaded properly. However, would QVARs be the best way to fingerprint the DMLs? It seems far more likely that two fan missions could, by happenstance, share a QVAR, while far less likely that two would share multiple objects located throughout the mission. Unfortunately, I doubt it will be possible to implement true custom resource loading with this method, due to the nature of dbmods. Regardless, this is looking good. EDIT: If the only fix required for The Gem is the old convict.osm, then this should suffice. In the fix archive, drop this in the .\dbmods\miss_all and name it "gem_miss15.mis.dml". 1) yeah, churning out a dozen and half dmls at the same time carries increased risk of typos and other mistakes, having someone else go try to load the missions and double check is desirable (I've loaded each mission separately and checked the logs, but better safe than sorry). 2) the FMdml folder is constructed in a way that should ensure its dmls load with maximum priority (so their content should override any old dmls present in the fm root if there are conflicts), but it would be good to test this in a real life scenario (place a dml in the fm root that changes obj X shape/size to 2x, and a dml that changes it to 0.5x in FMdml, and see which one wins. I think I'll have a shot at this real quick //checked and confirming, working as intended). but generally, the less messy your game install is, the better (unsurprisingly). not sure what do you mean in the second part where you delete stuff around, but basically, the way this is supposed to work is to have a separate folder with all the available fixes that the engine checks when the game is started, and the correct fix is applied with maximum priority if a matching mission is launched. - will kick the outdated stuff from the repo. - will add the Gem script load fix (woah, it really works? awesome). - I don't really mind that Noble Death fix is not critical. - ah yes, forgot about the repo also hosting T2 fixes. that's probably it. - as far as I can tell, the chances of a mission having the same goal target as a different mission is statistically very low, but should using the first non-zero value goal target qvar be found as not sufficient, a different fingerprinting method can be used with little trouble. as mentioned, this is just a proof-of-concept package, intended to determine whether it's worth to try to go this way - as I've said, I believe that if we can use this in 80% of cases or more, then it probably is. Last edited by voodoo47; 31st Mar 2019 at 06:16. Need a little help please. I've extracted your package into my TG folder but testing Out for a Walk and the dml is not loading, probably because I'm not setting up my cam_mod.ini correctly (yeah ok I'm stupid when it comes to files, but you knew that anyway). I've tried every combination I can think of including uncommenting 'FMdml folder' in 5 locations but still the dml does not load. Can you or someone else post their cam_mod.ini mod path with a mod path that works. I should have used quotes there - it's "FMdml" folder, not "FMdml folder". corrected in the original post. a regular mod_path of any sort should do fine (ubermods should be used carefully, and it seems like we don't need them here, at least for the time being). also, when testing the package, add "dbmod_log 10" to cam_ext, and check dbmod.log each time you run a mission, making sure only one mission dml is getting loaded each time (only one should be NOT rejected by the fingerprint system. so for example, if running the Item, the log should only show ite_miss20.mis.dml as getting applied). 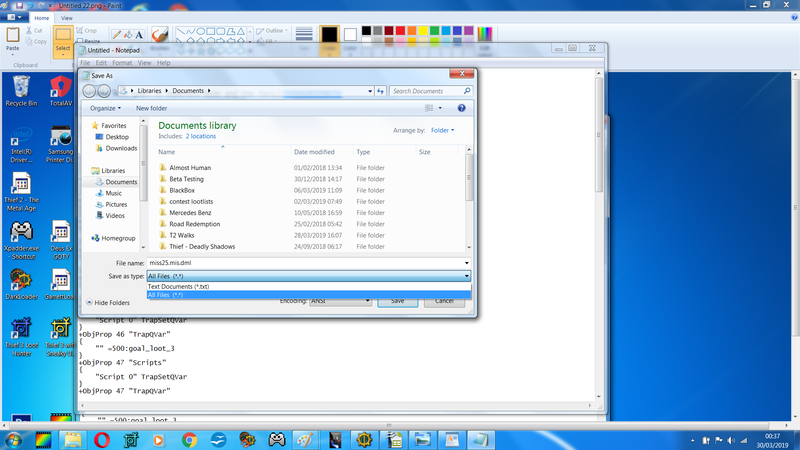 Last edited by voodoo47; 31st Mar 2019 at 06:24.
make sure no folder duplication is going on, when you open the FMdml folder, you should see a bunch of folders and files, not another FMdml folder. That's probably the problem, I extracted the 7z file directly into my Root folder and there is a FMdml folder inside the first one. Should have extracted to a temp folder and then manually moved those. yeah, see my previous post. also, it looks like your main gamesys dml is not loading NVscript - watch out, the FMdml package depends on this.